Feeling tired, unwell - not healing? Guessing at or just managing symptoms? Doubting a diagnosis? Not getting at the root causes? proper in-depth live blood analysis allows you to make health focused decisions just right for YOUR body - personal health mastery with our strategic personalized actionable recommendations . and be inspired. Quality live blood analysis and nutritional advice provide expertise for youth, teenagers, adults and their families - nutritional support for optimizing healing, strength, growth and re-balancing. ‘Let food be your medine and medicine be your food’. .. suffering from frequent bouts of fatigue and chronic tiredness? .. experiencing a lot of gas, bloating, burping, diarrhea, and acid reflex? .. noticing occasional blood or mucus in your stool? .. having skin issues such as hives, acne, psoriasis, eczema, skin rashes and rosacea? .. suffering from allergies, food intolerances, gastrointestinal issues? .. having a lot of aches and pains - arthritis, fibromyalgia and chronic fatigue? .. suffering from hormonal imbalances? .. experiencing brain fog, mood swings, confusion, lack of focus, depression? * Have you been diagnosed with some form of irritable bowel disease such as crohn’s disease, colitis, celiac or diverticulitis? * Have you taken anti-biotics in the past few years? * Have you taken what seems like way too much anti-inflammatories such as ibuprofen, aspirin, or nsaids recently? 20% discount for seniors (over 65) and juniors (under 20) for the first visit. We accept cheques, cash, e-transfer and all credit cards (through the PayPal system). Choose your live blood analyst wisely! A quick, small, sterile finger prick with a lancet (like a diabetic's) provides two small drops which are placed on two slides in a specific manner. 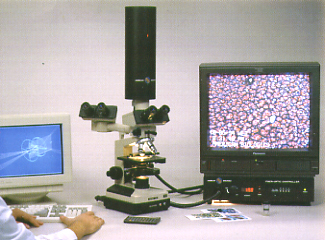 This is magnified 9000 times (via camera and video screen) for live and dry (also called peripheral and OST) analysis. Together these give enough information for a very comprehensive picture of YOU. Co-relations exist between blood elements, symbionts, bacteria and fungi. The main proven fact is that chronic diseases are created by increasing sickness tendencies of the endobionts. The bacteria, fungi and possible virus' and beneficial regulators develope in our bodies and support us or are changed to pathogenic agents of imbalance and diseases in multi-faceted ways, depending upon the inner terrain (also determined by acid-base balance, protein content and level of trace elements). This examination was developed by many unique researchers mainlu in France and Germany and later in the USA, including Prof. Dr. G. Enderlein. Stop guessing and have a proper, thorough microscopic nutritional analysis with sound advice and nutritional coaching. ELIMINATE fear and needless concern which comes from guessing at symptoms and then guessing at what they might mean and then more guessing at useful solutions. Make Live Blood Analysis Your First Choice, not your last resort. the GLYPHOSATE stealth war against all of us! A successful session below - 30 minutes - lots of heavy metals left behind! These healing modalities are a real treat for family, friends and pets to experience. These are thorough hands-on-healing classes - theory and practice - which anyone can learn - easily and empowering. We hear people talking about energy work - metaphysical healing details, etc.. and just what does this mean? Have a read at these classic articles by the great teachers that got my attention 20 years ago and they are still perfecting their insights and making it so much easier for the rest of us practitioners. This is information that is vital, even if you are a casual consumer of energy medicine and holistic wellness. Now you have the option of giving someone a gift of health. Simply order with a text or email.